Over the last month, I have been asking all of you to let go of over-thinking, self-judging, self-criticizing, adrenaline-driving minds in favor of heart-feeling, compassion-feeling, joyful-feeling, dopamine-producing hearts. I called it my Positive Thinking Only game. To move from your mind to your heart takes a lot of vulnerability, and from the feedback I have received and from the comments on the blog I have read, you absolutely are winning, winning, winning!!! Do not be afraid of being vulnerable. As Socrates tells Dan in The Peaceful Warrior, “A warrior is not about perfection or victory or invulnerability. He’s about absolute vulnerability.” Part of winning your fight against Parkinson’s is being a warrior who is vulnerable, admitting that you are not perfect, and knowing that your best is good enough. Vulnerable: Open to censure or criticism. Let’s take a look at the journey to recovery from Parkinson’s. It begins by announcing, “I have the power to heal myself. I am going to cure myself from a disease the experts say is incurable.” This alone opens you up to censure and criticism from non-believers. In the middle of the journey, you feel better on the inside, but you are not looking so great on the outside. In the middle, you announce, “I have the power to heal myself. I am going to cure myself from a disease the experts say is incurable. I have faith in my recovery and I understand that there are times when I am going to feel worse and look worse before I get better.” This alone opens you up to censure and criticism from non-believers. In the end, you announce, “I am cured.” This alone opens you up to censure and criticism from non-believers. This is why your faith in your recovery has to be more powerful than other people’s opinions about what you should be doing about your Parkinson’s. This is why you have to stop caring what the other people think about you and what you are doing. It was my final issue from which I needed to let go, from which I needed to surrender, from which I needed to extricate from the very being I thought was Howard Shifke — and just when I let go, totally and completely, surrendering caring what anybody was going to think about me or my having cured myself, I had a shift…my world view went from my mind down to my heart…and I started feeing other people’s suffering…and my dopamine flowed, and as it cascaded down my body and through my body, I was transformed from imbalance to balance, from illness to health, from thinking to feeling, from Parkinson’s to cured from Parkinson’s. That was nearly five years ago. You can do it, too! If you cannot find somebody with whom you feel comfortable being vulnerable, please feel free to email me at howard@fightingparkinsonsdrugfree.com. Those who have opened their hearts to me in emails in the past have expressed by the end of their emails that it felt so good to “get it out” to somebody who would not “think” they were complaining, but instead, who would “feel” their suffering…and who would be compassionate and not judgmental. You do not need to do this alone. You should not do this alone. I had Sally on my journey. We cried, we laughed, and sometimes we just held each other. I was able to be completely vulnerable with Sally. She did not judge me. She listened. She had compassion for me. She knew I was not complaining, I was just opening my heart and sharing what was going on…reporting the facts of the day…sometimes trying to explain the non-explainable nature of Parkinson’s, and sometimes when I couldn’t find the words, I just cried, and she held me. She, too, knew there was nothing to say. Happy Birthday, Sally. I am forever grateful for you. You also taught me that nothing ever was gained by being afraid. You helped me defeat fear and hold on tightly to my faith. Thank you. Fear blocks being vulnerable. We become afraid of the censure and criticism. Faith says it is okay to be vulnerable. Not only is okay to be vulnerable, it is necessary in this recovery. In the end, complete vulnerability means completely surrendering the person who you think you are and not being afraid what the other people will think when you again become the essence of who you are, on the inside…the new you…the you who has been in there all along but who is covered up by a mountain of ice…chip away, day by day…be vulnerable, and do not be afraid. “First they ignore you” when you say you are going to cure yourself from Parkinson’s. “Then they ridicule you” when they realize you are ignoring traditional conventions of what to do about Parkinson’s. “Then they fight you” when they realize how strong your faith is and that you are actually curing yourself from Parkinson’s. “And then you win,” you cure yourself, in part because you finally realize that those who ignore you, then ridicule you, then fight you about curing yourself from Parkinson’s are suffering…so instead of caring what they think and changing what you are doing, you find compassion in your heart for their suffering…and your dopamine flows. This, my friends, is why you are winning, winning, winning!!! 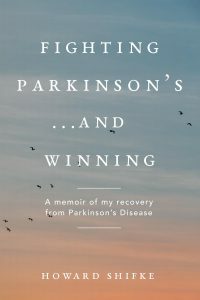 38 Responses to Fighting Parkinson’s, and winning, winning, winning! Hi to all my fellow Warriors. I am delighted Howard that you mentioned the origin of where I got the word from, it was from you mentioning The Peaceful Warrior by Socrates. It’s truly how I see us all. Big love to everyone. Thank you for your posts. I really enjoy them. Bless you Sally and thank you! This blog really spoke an important truth, for me. My PD personality is imbued with being invulnerable. It is hard for me to express feelings of fear, anxiousness, and worry. This was my pattern before PD. And part of my healing has been the surfacing of a lot of undisclosed fear throughout my childhood and adults years. It feels so GREAT for you to encourage the importance of being vulnerable — e.g., with my wife, a best friend, etc. As a result, I’ve learned to better hold BOTH my fear and self judgment, while at the same time celebrating the great healing progress I am making, which has opened me to far greater aliveness than I ever had pre-PD. There is a bit more to do, and I’m fully ready, able, and inspired to do just that. You consistently hit on where I still need to let go. More and more I’m seeing that my drive to be perfect and well liked helped me climb into the costume of Parkinson’s ! Instead of trying to force this costume off I’m now ALLOWING it to fall away. Thank you for putting it into such a clear message. As usual, your blog came along at just the right time and with just the right message! Happy Birthday Karen and Sally! And thank you once again Howard for a very timely post. Being vulnerable is something I have never liked being and I identify with Barry’s comments. It’s good to know we have each other on this journey, it’s a great comfort, thank you to everyone! puede liberarnos del apego al yo. de ella podemos encontrar la paz. sencilla y ampliar el círculo de la compasión poco a poco. generosa, en lugar de confiar sólo en las palabras o en los sentimientos vagos. Poco a poco podemos ir ampliando nuestra compasión. capacidad para ayudar a los demás. felicicdades karen y sally dios bendiga a todos mis compañeros. You can free us from attachment to self. it we can find peace. simple and widen the circle of compassion gradually. generous, rather than rely solely on the words or vague feelings. Gradually we can gradually increase our compassion. Happy Birthday Sally, Karen, and God bless all my colleagues. Bless you Leo, thank you. The price of admission to a life post-Parkinson’s is vulnerability, which is also the prize! Thank you for the deeply on point message, Howard. I have fought adopting this ‘pricey’ prize as long as I can remember and am battling this adrenaline-mode chunk of the Recipe right now; may well be the key to my impasse at doing the Qigong part. If there’s anything good about being in this Iceberg of a body, it may well be it’s ushering in of this birth into my new self, no longer ‘needing’ to have this excruciating PD experience. Thanks for the faithful permission to allow vulnerability centrally in my life; an answer to my prayers and wonderings theses days. Hopefully this assists my energetically doing the exercises. ‘It’s my ‘Parky’, I’ll cry if I want to’…then bid you adieu, PD. Thanks Howards for the wonderful post. Happy Birthday to Sally. Thank you for your care of Howard which in effect helps us greatly in our fight against PD. You are amazing! Howard is lucky to have you and we are lucky to have you both! Happy birthday Sally and Karen. Allowing myself to be vulnerable is probably my biggest challenge but I’m practising hard and am on my way! Thanks Howard for your beautiful heartfelt message. Happy birthday to Sally & Karen! I have experienced the “Wall of Skepticism” and at first it bothered me, but now it is expected and I no longer ruminate about other’s opinions. Thank God for all the support, otherwise, I might be wallowing in adrenaline attitude. This is definitely a growth experience and I am grateful for it. Love to all! Happy Birthday Sally! I’m grateful for your sage and shiny input. Hope your day was filled with smiles! PD brings us to our knees and humbles us in a big way thus creating vulnerability! It strips us of any pride and it opens our heart with great compassion and gratitude of all things ! My heart is bursting with love to all of you for your support! Happy birthday Sally and Karen! Thank you for this amazing post. I have been working with your positive thinking only practice and it’s really making an amazing difference. Also, I’m beginning to feel that the gift of Parkinson’s has been for me to be vulnerable – something I’ve always been terrified to do. I am so grateful to you, Howard, for the Recipe and your profound wisdom. Wow…what wonderful comments…. huge insights…so many of us feeling joy and compassion…Happy birthday Karen and Sally…sweet gratitude to all! Thank you to Howard for such a soul searching post. Thank you to all of you for your beautiful comments. Happy Birthday Sally. I hope that you had a beautiful day. Happy Birthday to Karen, know that we are all celebrating with you in spirit. Thank you for all the birthday wishes. It made me feel very special to be part of your Parkinson’s community! I read all of your comments after each post and appreciate the vulnerability you show with each comment. I have such faith in all of your recoveries. My heart soars when progress is being made by all of you. You have picked a courageous path to recovery…enjoy the ride…I am cheering you on every step of the way! PS. Karen, Happiest of Birthday’s to you! Hi Sally, lovely to get a post from the lady herself, Mrs Shifke 🙂 Beautiful message to us all. Bless you.